AL MAHER (AUS) (Bay 2001-Stud 2005). 5 wins-2 at 2, VRC Australian Guineas, Gr.1. Sire of 438 rnrs, 284 wnrs, 27 SW, inc. Delicacy (SAJC Schweppes Oaks, Gr.1), Almalad - Friends of Ka Ying (H.K. ), Fat Al, Diamond Drille, Majestic Music, Budriguez, All Legal, Badawiya, Pheidon, Oasis Bloom, King Lionheart, Madam Gangster, Speedy Natalie, Marheta, Unchain My Heart, Amovatio, Dance With Her, Buddy Bundy, River Delta, Terror Force, Becerra, etc. Swat (g. by Strategic). 8 wins from 1200m to 1900m, A$140,830, AJC Blockbuster H., STC Theraces.com.au H., Diageo & Icon Brands H., 2d AJC Veloso H., STC Roxy Hotel Parramatta H., Congratulations Forensics H., 3d AJC True Blue Chemicals H.
Blessing Win (g. by Dehere). Winner at 1650m, HKJC Pottinger Peak H., 3d HKJC Centurion Restaurant & Bar H.
Cinnamon Carter (f. by Al Maher). Winner. See below. Moon Mission (g. by Anabaa). 5 wins-1 at 2-from 1200m to 1600m in Aust. Some Journey (g. by Tale of the Cat). 2 wins at 1200m, 1650m in Aust. Triple Vitality (f. by Stratum). 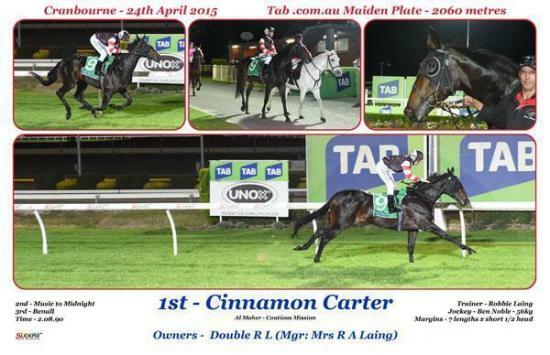 Winner at 1500m in Aust. Kaepernick (Fastnet Rock). 4 wins to 1350m, A$253,550, to 2015-16, ATC Drummond Golf H., Rexel H., MVRC Quest Moonee Valley H., 2d BRC Hinkler H., L, ATC Tab.com.au H., 3d MRC Italktravel S., L.
Our Bullbaa - Dragon King (Mac.) (Anabaa). 2 wins at 1600m, 2000m, A$76,450, M$49,500, MRC Burberry H., 2d Tasmanian Derby, Gr.3, VRC Hilton Nicholas 2YO H., VATC Springvale H., Coal Pak H., 3d MRC Select H., VRC Hobson's Bay 2YO H., Portland Player 3YO H.
Mine Two (I Am Invincible). Winner at 2, A$127,950, in 2014-15, ATC TAB Betting Season 2YO P., 2d ATC Primo Moraitis 2YO P., 3d ATC Schweppervescence H., Gr.3, 4th ATC Reisling S., Gr.2. Bracing Rhythm. 7 wins from 1200m to 1600m, A$115,450, AJC Hunts Motel H., Billiards & Snooker Welter H., STC Parkroyal Parramatta Series H., Fastway Couriers H., 2d AJC Botany H., 3d AJC Qantas Phil Waugh Flying Welter H., Princesses Welcome Welter H., Country Link Kitchens H., Spring Games Festival H., 4th STC Lord Mayor's Cup, L.
Space Dancer. 5 wins from 1400m to 2000m, SAJC Carlton Draught H., 2d SAJC Blue Gum Farm H., 3d SAJC Distinctive Homes H.
Duke Ellington. 2 wins at 1400m, 1800m, WATC Tabtouch Supporting WA Racing H., 2d WATC Free Entry on WA Day H.
IDEAL PLANET (Planet Kingdom). Second on The 1981-82 Australasian 3YO Classification (1300m-2000m). 9 wins to 1400m, A$219,320, BATC Doomben Hundred Thousand, Gr.1, Qld Tatt's RC WJ Healy S., L, AJC Lachie Melville H., Tom Street Welter H., Sam Hordern H., STC Baguette Welter H., Lite-Ace Happy Wheels H., 2d VRC Newmarket H., Gr.1, AJC Galaxy H., Gr.2, MVRC William Reid S., Gr.2, QTC Lightning H., Gr.3, STC Sir Robert Askin Cup, Gr.3, AJC San Domenico S., L, 3d AJC All-Aged S., Gr.1, QTC Katies Cup, Gr.3, 4th NSW Tatt's RC Carrington S., L. Sire. Dashing Soltaire (Boucher). 8 wins-2 at 2-to 1500m, A$84,855, AJC Vaucluse H., Elizabeth Riesling Welter H., Jack Jarvis Welter H., 2d Illawarra TC Brambles Classic H., L, 3d STC Peter Pan S., Gr.2, SAJC John D Lee S., L.
WINTER SHOW (Lunchtime). 7 wins-1 at 2-at 1000m, 1200m, WATC Beaufine H., L, Gainsborough Quality S.H., Hocking H., Council H., 2d WATC Summer S., L.
Out Break (Palace Music). 15 wins to 1500m, A$266,785, BTC On Time Copy Centre H., Qld Tatt's RC Country Cup, QTC Morgan Stockbroking H., 3d Ipswich TC Eye Liner S., L.
BURBERO (O'Reilly). 13 wins from 1150m to 1600m, NZ$5,625, A$700,845, to 2015-16, ATC Ajax S., Gr.2, Missile S., Gr.2, TAB Rewards Mile H., TAB Rewards H., Big Sports Breakfast H., Strong Relationships H., Greg Carmody H., McGrath Estate Agents H., 2d ATC Parramatta Cup, L, Canberra Cup, L.
Race Record: 28 Starts 1-6-3 A$48,865. Winner at 2050m in 2014-15, 2d MVRC Melbourne Signage Concepts P.